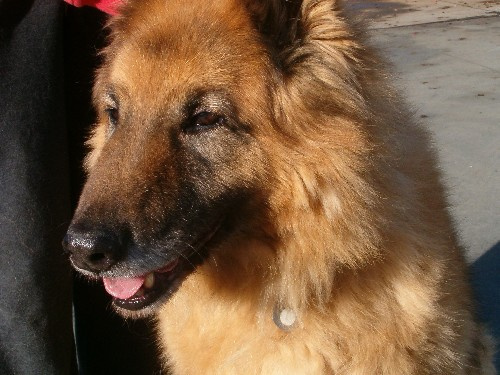 Barney is a 10 year old German Shepherd who first presented at the clinic in April 2004. An examination for lameness picked up on minor joint changes and arthritis was suspected at the time. Throughout 2004, Barney was treated for minor conditions and placed on medications which minimised the clinical signs on arthritis. In March 2005 Barney's lameness worsened considerably. He had a very proppy gait, significant reduction in the range of motion of his hips, stifles (knees), hocks and shoulders. He was placed on anti inflammatory medication for two weeks and a course of Pentosan injections was initiated. Pentosan stimulates the joints to increase joint fluid production which reduces cartilaginous friction and inflammation. Since Barney responded so well to the injections of Pentosan, it was decided to continue them monthly. In September 2005, Barney also started on Sasha's Blend which contains green lipped mussel and shark cartilage. This powder was mixed in with his evening meal. The Pentosan injections were dropped back to once every 6-8 weeks. Rimadyl – a long term anti inflammatory medication was only provided intermittently when Barney had had a fall and aggravated his arthritis. His response to medications was always positive. Currently, Barney is on monthly pentosan injections, daily sasha's blend and glucosamine tablets. Barney's case highlights some of the continued therapy that is available for patients with chronic arthritis. Radiographs (X-rays) are always recommended to confirm arthritis and gauge the severity of the disease. They can also be a tool to assess continued arthritic reaction over the length of your pets' twilight years. Long term anti inflammatory may be prescribed but if your pet is on them for life, regular blood tests are strongly recommended to ensure the patient's organ functions can tolerate the medications. Ensure that there is a warm place they can curl up in and avoid draughty areas. Elevate the bed to reduce heat loss to surroundings. Regular gentle exercise (20 minute daily walks on level ground) is necessary to maintain joint mobility. If pain persists, seek veterinary advice. The comfort of your senior pets is paramount during climate changes. Arthritis is managed with a multi factorial approach which includes both medical and adjunctive therapies, tailored to the individual. Book in to have a chat if you suspect arthritis in your pet.